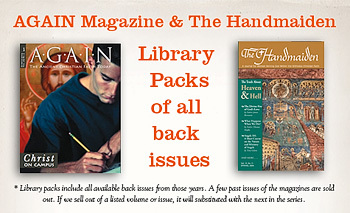 Conciliar Press announces an outstanding sale on all available back issues of AGAIN Magazine and The Handmaiden Magazine. The publications are arranged in groups and are sold as Library Packs at 75% off the original cover price. Both magazines are a great and timeless resource of Orthodox spirituality, and contain content by some of the best Orthodox writers and editors over the last 25 years. It is the hope of Conciliar Press, that this sale will help get the magazines into the hands of all those who loved and enjoyed them over the years and will help to preserve the rich heritage and legacy of the publications.